I hope that every Seventh-Day Adventist clergy and laity will read this book and respond to its challenging claims. Author Garrick D. Augustus has published a compelling exposé that uncovers misrepresentations the Seventh-Day Adventist Church has made against Victor Houteff’s teachings and presents evidence proving the Church willfully rejected that which it knew to be true and lied to the world church for more than 80 years. 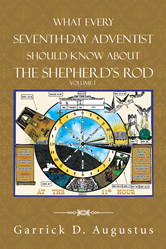 In “What Every Seventh-Day Adventist Should Know About the Shepherd’s Rod: Volume I,” Augustus challenges modern Adventists to forensically review the denomination’s portrayal of The Shepherd’s Rod, unveils the distinction between Davidians and Branch-Davidians and calls for the Church to allow for a public hearing and adjudication of this purported message of truth. Ultimately, Augustus’s book provides an in-depth examination of the ongoing history of this Seventh-Day Adventist controversy and puts forth a thorough summary of Houteff’s teachings, providing clear and accurate answers to the questions raised against the Rod’s message. Garrick D. Augustus is a Seventh-Day Adventist Christian who has also studied The Shepherd’s Rod. Augustus has a background in engineering and has brought together the forensic methods of evidence analytics as well as the investigative methods of internal evidence analysis to examine claims brought against The Rod by the leaders of the Seventh-Day Adventist Church. His research has taken him from the Heritage Library in Loma Linda, Calif., to the Biblical Research Committee in Silver Spring, Md., and beyond. Augustus earned his Bachelor of Science in Mechanical Engineering from California State University, Long Beach, and is a member of the Association of Energy Engineers. He currently resides in Webster, N.Y. To learn more, please visit http://www.sdaprophecies.com or follow the author on Twitter.